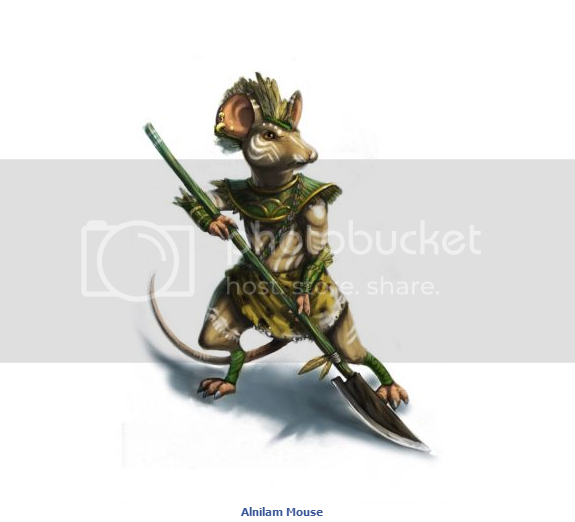 The Alnilam Mouse is a breed of mouse found in the Tribal Isles region. They are known to drop Savoury Vegetables in Nerg Plains. The Alnilam mouse does not hunt with speed nor stealth. Their ancient "technique" involves running out from the trees, yelling loudly, while brandishing a well-sharpened spear. The sight of dozens of these hunters running and screaming in unison is one of the most unique sights on the island. Alnilam mice have no specific preference for any kind of cheese. Alnilam is a typical member of The Nerg Tribe group. As such Tactical weapons are very effective against it, and all other power types are ineffective. Alnilam, Alnitak and Mintaka are the names of the three stars in Orion's belt. Alnilam mice began dropping the Stripy Red Egg as loot, on 17 April 2011, for the Spring Egg Hunt 2011 event. This page was last edited on 26 June 2014, at 16:04.